I made my first contact with Don Lund via telephone late in 2007 when I started my research to find out what the experience was for the major league players who debuted as the color line was slowly eroding. He shared his stories of being signed to the Brooklyn Dodgers only a few weeks before Jackie Robinson, and how both of them were offered positions on the major league club on the same day in 1947. We talked about his travels through a variety of major league organization, and his long standing career at the University of Michigan as a three-sport athlete, coach, and later assistant athletic director. His bird's eye view at Michigan of the budding talents of Bill Freehan, Barry Larkin, and Jim Abbott all rolled off his tongue as he beamed with pride describing his favorite stories of each player. He glowingly spoke about his 1962 National Championship team and the influence that Ray Fisher had on his career. He had energy to continue telling stories, not about himself, but the many people he met along the way. Our conversations routinely lasted an hour or more. Earlier this week, I sadly received the news that Lund passed away last week at the age of 90 at an assisted living facility in Ann Arbor. 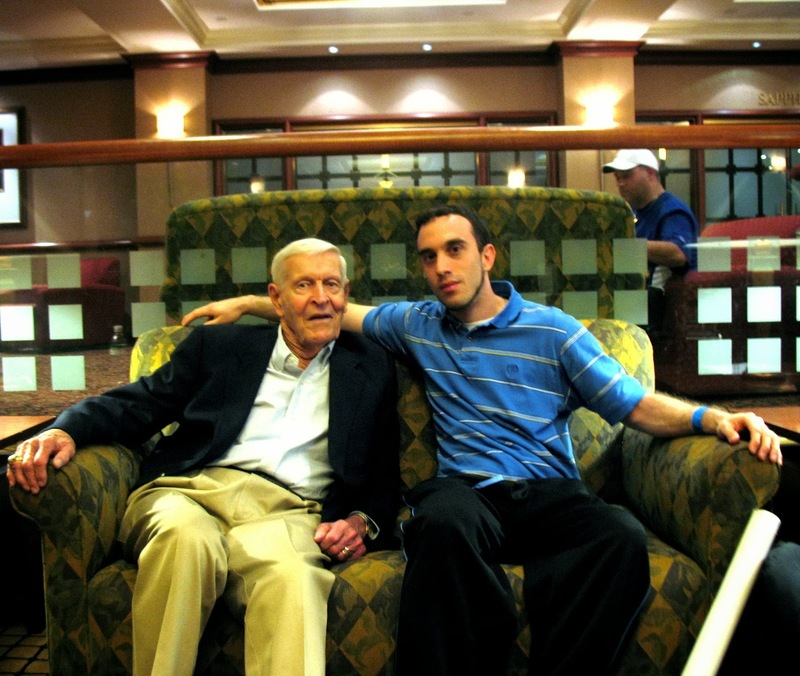 The mention of his death immediately brought back memories of our 2008 meeting in New Jersey. Knowing that he would be coming to the local area for what was most likely to be the final Brooklyn Dodgers reunion, we made plans to meet at the show and spend some time together. My only picture of Lund was what was on his baseball cards, so it was difficult for me to imagine what I was going to encounter. Time works differently on our baseball heroes, and Lund was 55 years removed from the portrait on his 1953 Topps card. I walked up to the room, and there was Lund, holding onto a walker, partially stooped forward, smiling as we finally made our acquaintance in person. It was hard for me to envision him as the square shouldered running back that garnered a first-round draft choice from the Chicago Bears, but his grip was still incredibly firm as he reached out to shake my hand. Within minutes of our meeting, Don made me feel like we were old pals from yesteryear. He introduced me to all of his old teammates as his friend. I watched as he signed away at all of the items the promoters put in front of him, and then as he happily met with the many fans that traveled from far and near to spend some precious moments with the living members of New York's bygone team. As the signing finished, I went with Don to pick up his check from the promoters, as he had a few hours left before his ride to the airport. He never once scoffed at the amount, even though the quantity of items he signed brought the total to maybe $1-$2 per signature. The money wasn't his motivation for being there; it was to see teammates that he hadn't seen in some fifty years—guys like Howie Schultz, Lee Pfund, Mike Sandlock, Ralph Branca, and Clyde King, all teammates when he made his debut in 1945. We sat around with Schultz and a few others in the hotel lobby, talking baseball while we shared some refreshments. As I went to pay, he steadfastly refused to let me do so, insisting that I was his guest for the day. As I wished him a safe trip home, he extended a handshake and a hug, wishing me well in my endeavors. The way Don treated me that was was the embodiment of his spirit; a classy gentleman who went out of his way to treat others well. I kept in touch with him on the phone and in the mail, exchanging correspondence once or twice a year. He always was willing to talk baseball, and in between the lines, sprinkle a few guiding thoughts for life's travels. We last spoke shortly after he moved to an assisted living facility in Glacier Hills, and even as recently as a month prior to his passing, he still had hope that he would be up and walking again, able to hit fungoes to the Michigan baseball team. His had a profound effect on Michigan athletics, not only for their program, but for the many players he reached. Dave Campbell, who was the first baseman on Michigan's 1962 National Championship team, (who later played eight seasons in the majors, and spent two decades as a baseball analyst on ESPN) called Lund in the wake of his passing, a man of, "great leadership ... and great integrity," and was one who, "had a great influence on me while I was there." I wish I had the opportunity to have met Lund earlier than I did, or even to have been one of his players, because in the short time we interacted, I could see how his tremendous character helped to shape the lives of so many young men.